Bronx Arena requires that students complete senior portfolios as their culminating projects before graduation. 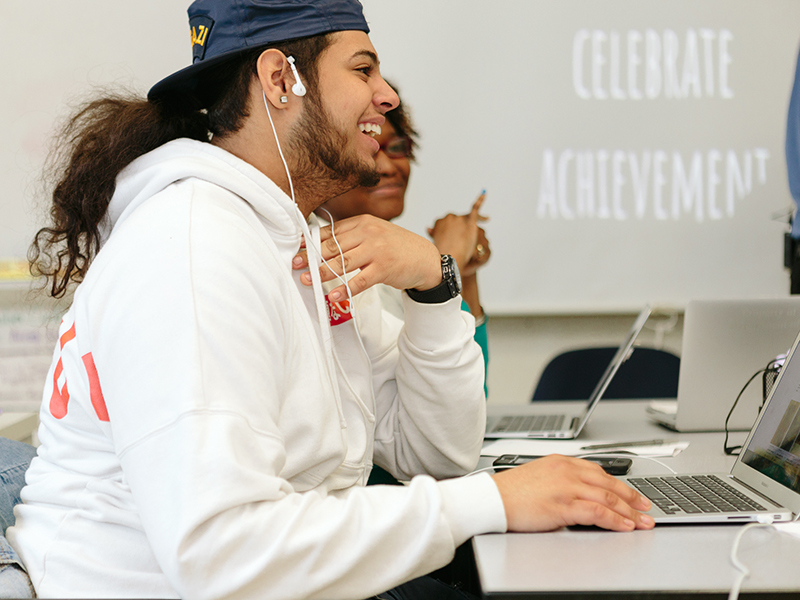 Student autonomy is foundational to their instructional approach, and students gradually build their autonomy throughout their time at Bronx Arena. Challenges and capstones are projects that play a large part in this scaffolded approach, as challenges are harder and more complex than daily instructional learning activities, and capstones are even more involved. Senior portfolios are the “capstone of capstones,” and the most challenging projects that require the largest amount of student ownership. Senior portfolios require students to design and build a project on their own, applying the concepts of Bronx Arena’s instructional model (challenges and capstones) to a completely new topic. Students are able to pick any topic that interests them. For example, a student who enjoyed skateboarding and had an interest in physics chose to create a video breaking down the physics of skateboarding tricks. The senior portfolio project involves designing the course (including identification of the competencies addressed), creating rubrics, and the formation of the curriculum. Teachers can provide support as needed for the instructional components of the course, but since the topics are so diverse, students must also find a mentor (from within or outside of school) that can support them in topic-specific areas of the project. After designing the course, students must complete the work (research, analysis, etc.) and craft a presentation, demonstrating a high degree of ownership over their learning. Senior portfolios are designed with college in mind. If students can complete a senior portfolio, they should have the skills and agency needed to be successful in college courses. Determines the topic for their senior portfolio. Designs a course that they need to complete to master the topic selected. Completes the coursework they designed. Presents on their topic to students and teachers. Supports students by acting as, or helping them find, a mentor for their senior portfolio. Grades students on their presentation. Houses documents that provide structure for students to design and complete their work and present on their projects. Provides access to unique resources outside of school. Bronx Arena is an alternative high school that serves overage and under-credited students in grades 9-12 in the Bronx borough of New York City. Each student has a custom education plan meant to help them optimally learn what they need to graduate. Technology components help students move at their own pace through individualized education plans while still getting the support they need to be successful.